In 1887 France’s Ferdinand Arnodin, the son of a bridge inspector, received the first patent for an aerial transfer bridge, often called a “ferry bridge.” But he didn’t build the first one; he helped his friend Alberto Palacio build one of Palacio’s own design: Spain’s Vizcaya Bridge, which connects the towns of Portugalete and Las Arenas at the mouth of the Nervion River. Completed in 1893, the 147-foot-high bridge spans 525 feet and was the first of its kind in the world, carrying both traffic and people from a high suspended gondola. Palacio was a disciple of Gustav Eiffel, designer of the famous tower in Paris, so it’s not surprising that his bridge is regarded as “one of the outstanding architectural iron constructions of the Industrial Revolution.” But it was Arnodin’s transfer bridge in Rouen, France, that inspired Thomas McGilvray’s idea to span the Duluth Ship Canal. Arnodin’s bridge opened on September 16, 1899. Its towers stood 220 feet above the piers along the Seine. It stretched 469 feet across the river, and its span rested 164 feet above the water. Its ferry car, forty-two feet long and thirty-three feet wide, sat twenty-three feet above the water. It had two cabins, one with windows, the other without: first class and second class (first class cost ten centimes and second class five). It crossed the Seine in just fifty-five seconds. In 1940 French Army engineers blew the bridge in a futile attempt to slow the Nazi advance. When Duluth’s bridge went into service in 1905, transfer bridges were also in use in Newport, England (also an Arnodin design); Bizerte, Tunisia; and Nantes, France, over the River Loire. But Duluth’s bridge was the only one of its kind in the western hemisphere. 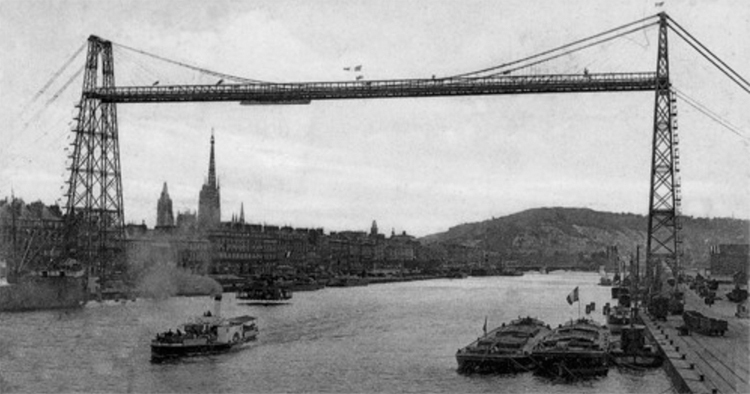 It was also the only stiff-trussed aerial transfer bridge anywhere, and the only ferry bridge operated by an overhead cable system. The others used cables to suspend the ferry car, which was pulled back and forth by a submerged cable or chain which ran through an electrically powered revolving drum on the ferry car. (The cable simply lay along the bottom of the canal when not in use, but while the ferry car was in operation the cable would naturally be pulled out of the water in front of the car and the slack of the cable would sink back down behind the car as it crossed.) McGilvray and C. A. P. Turner (the engineer who actually designed the bridge based on McGilvray’s sketch) worried that Duluth’s colder climate would cause breakdowns in the winter, and the Duluth canal was only 300 feet wide—there was too great a chance of the cable becoming entangled with a vessel’s propellers. This problem spawned the idea of the overhead cable system. In 1905, the same year the Duluth Aerial Transfer Bridge was finished, two transfer bridges were planned to link the Virginia cities of Norfolk, Berkeley, and Portsmouth by crossing both the north and east branches of the Elizabeth River. The plans were to be nearly identical to those patented by C. A. P. Turner for the Duluth bridge, and McGilvray himself would supervise the construction work done by Modern Steel Structural of Waukesha, Wisconsin, the same firm that built Duluth’s aerial bridge. The bridges were never built. Duluth City Engineer Thomas McGilvray at once recognized the potential of a similar bridge over Duluth’s Ship Canal. In 1899, the same year the French bridge would be completed, McGilvray sat at his drawing table, adapting Arnodin’s plans for the Duluth Ship Canal. The City loved it. After endless rejection, they had given up on a bridge that would allow railroads access to Minnesota Point and its proposed twenty-two miles of docking space, so any structure for crossing the canal no longer needed railroad tracks or contiguous access. The idea was certainly less expensive than any other previously proposed, and a pittance compared to the tunnel idea: perhaps no more than $100,000. But much had to be done before a single rivet was hammered in place. The city needed to make sure Captain McDougall’s Lake Carriers Association would not once again oppose the plan, it needed the permission of Congress and the Secretary of War to build the bridge on and over government property, it needed to find a firm willing to build the bridge, and it had to come up with the funds to pay for the bridge and its operation and maintenance. All that would take time—much more time than anyone ever thought. In 1900 the city established the Canal Bridge Commission to get the job done: Alderman Thomas F. Trevillion, Common Council President James L. Cromwell, Councilor Marcus B. Cullum, Mayor Trevanion W. Hugo, City Attorney Oscar Mitchell, and William B. Patton, who had replaced McGilvray as City Engineer. The reason Patton replaced McGilvray at this crucial point in the bridge’s development remains unclear, but there are clues that suggest it was politics at work. Back in 1897, McGilvray had not stepped into the City Engineer’s position easily. Despite being appointed by the Board of Public Works with a 2–1 vote, Public Works President Charles Wilson protested the results, championing a second nominee, E. J. Duffles—and the Council had to confirm the Board’s vote to make it official. A vote to confirm McGilvray ended in a 9–6 defeat. The next day the Duluth News Tribune’s headline read, “Down Goes Mr. Mac.” Whatever the nine nay-voting aldermen had against McGilvray, it was cleared up by June of that year, when he officially took office as the City Engineer. So in 1900, the year Trevanion W. Hugo replaced Henry Truelsen as Duluth’s mayor, Patton replacing McGilvray may have had more to do with who sat in the mayor’s office and on the Common Council than either engineer’s qualifications for the job. While Patton had replaced McGilvray just as his aerial bridge idea was moving forward, there is little doubt McGilvray was in constant contact with the project, albeit not at an official level: since Patton was now preoccupied with the matters of the city, McGilvray stepped in to help run Patton’s Duluth Engineering Company; essentially, they traded jobs for four years. From Crossing the Canal: An Illustrated History of Duluth’s Aerial Bridge by Tony Dierckins (Zenith City Press, 2008) featuring over 250 historic photos, illustrations, and lithographs. Click on the cover to preview the book.